May I complain a moment? I have three computers and none of them work worth a darn. One is in the shop ... not to be fixed, just to get the information off of it. That one I can forgive, it's old and we got it free used and it has served decently for years. The other two ... are not getting off the hook so easily, they aren't that old or kind. The one I'm on now is slow as molasses today ... though not two days ago ... and won't do more than a tiny bit of work without being rebooted. Same for the other one. I'm not sure what it takes to fix them, but I will be trying to figure that out, and fast! Grrr ... I'm done now, until the computer freezes again. The most amazing part, though, and largely in a good way, is realizing how reliant we all are on the home computer and the Internet ... and observing where electronics and technology has taken us over the years. Something different. Yes, still plenty of white sashing (love, love, love the sashing ... I should consider seriously consider buying white cotton by the bolt ... hmm ... maybe once I can browse the Internet I'll look into that), but the "stripes" are going the length of the quilt. I love the look of this! The fabrics include an Anna Maria Horner print (the dotty red and pink) ... which is awesome in a large piece of fabric and really cool when used in a smaller piece ... the print becomes very funky and random looking. I used it for the binding as well and I love the little random-appearing bursts of color it provides. The starting off fabric was the bluish cotton with multi-colored spots. I wish I had a better image of that fabric, it's very simple but filled with the neatest tones of colors. 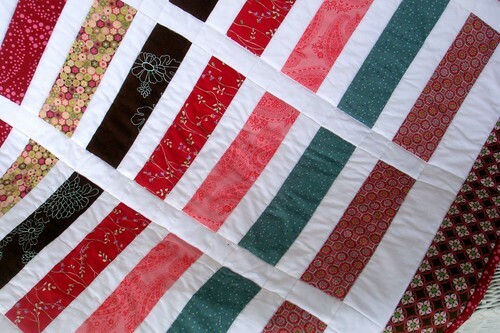 Basic stitch in the ditch quilting. I haven't washed this yet but can't wait to see how it looks after a round in the dryer. I used bamboo/cotton batting again and am still crazy about it. It holds itself together so well and provides just the right amount of loft ... you can tell it's there, but it isn't "poofy" ... and it feels so good to the touch. Yum! You may have too little RAM; otherwise known as memory. It is what makes the computer work fast. I increased my computer's memory from 256 MB to 4 GB by buying extra GBs from Best Buy and having the Geek Squad install. The total cost for making my desktop faster--$160 for memory and install. It is worth it. However, you must make sure that your computer allows for more memory. Good luck. 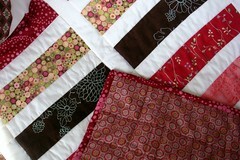 And I love the coin quilt. Very lovely! sorry about the computer woes...so frustrating. 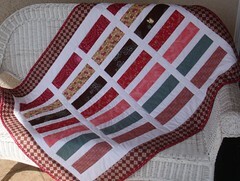 love this new quilt...simple, but wonderful. simplicity can be such a great way to show off fun fabrics.